Welcome to Analog-Precision, the home of the Ultimate-Preamplifier formerly known as the Hi-end DSP based multi-channel integrated Preamp/Crossover/DAC project as featured on DIYAUDIO. We at Analog-Precision are dedicated to the art and science of sound reproduction. We continue to push the envelope using the latest technologies available with the aim of making it available to people with the same goals as us ! You've probably seen or heard about the 50K-plus audio systems exhibited at the hi-end audio shows and dreamed about owning the same equipment in your own listening environment but just couldn't quite afford it. Well dream no more! Analog-Precision seeks to bridge the price-performance gap by producing a series of hi-end audio products without the hi-end audio price tags. 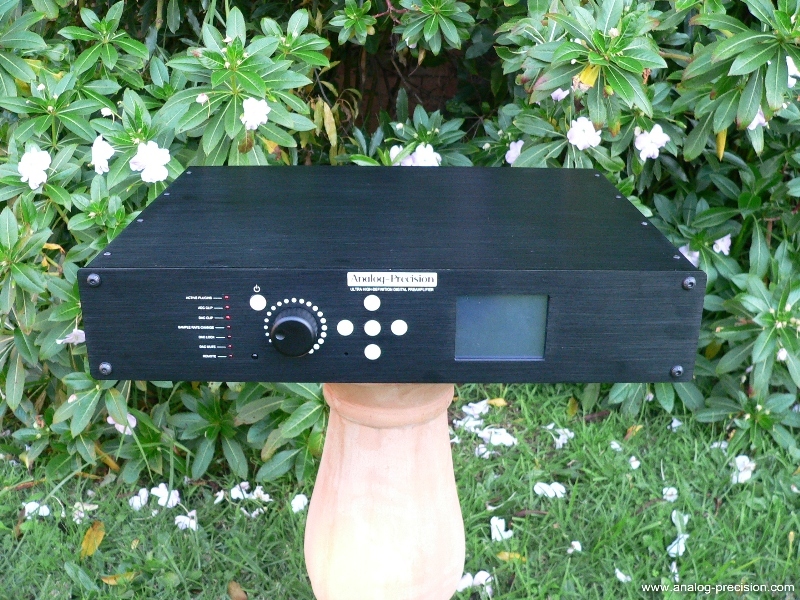 Starting with our first product is the Ultimate-Preamplifier. This is a no-holds barred digital/analog preamplifer with the verstatility that meets and exceeds all of todays hi-end expectations in terms of performance and quality but without the excessive price tag.